Here we go with the grand Berkman. The biggest and baddest COMC Berkman that I got this go around. I love it. Ridiculous. I'm glad they made a card of him in this year's Tribute and glad I waited as long as I did to pick it up. 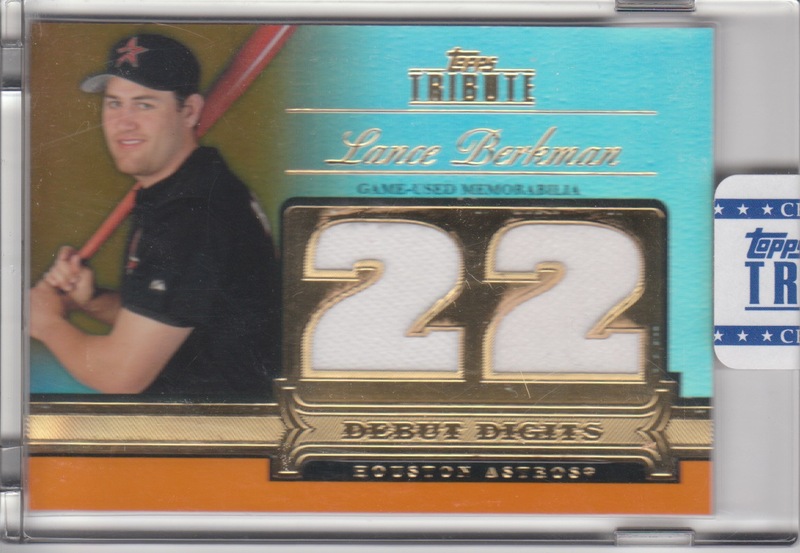 Berkman used the #22 for 34 games as a rookie, even though everyone is pretty familiar with him wearing the number 17. He would have picked #7, but a certain guy named Biggio had that number. This leads to the question: Do I keep it slabbed? I don't have a binder page to put it in slabbed, but isn't part of the big deal of these cards the fact that they are slabbed? Opinions? It's your card, do what you want. I've gotten graded cards before and busted them open. I don't care about the grade. I think I busted open the eTopps card I got as well. I personally would bust it open, the only reason it needs to stay in it would be if you planned on selling it.